It is certainly a pleasure to know what our customers feel about us! I was completely overwhelmed when I went through the articles written by Mukund, a student of SPASTN. Read on to know more about Mukund and how Avaz has transformed his life. Thanks to Ms. Jyothi, speech therapist of Mukund and Mrs. Jayashree, the Director of SPASTN. 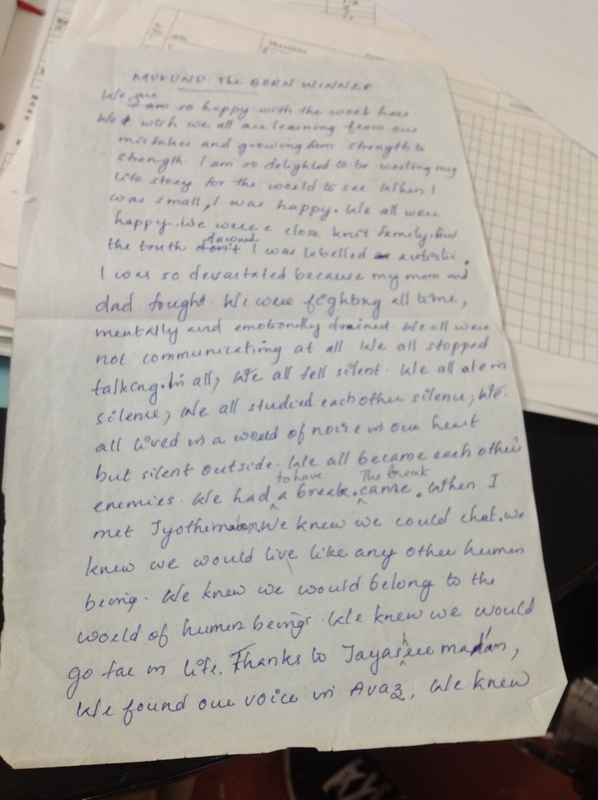 The article below was typed out on Avaz by Mukund and his teacher has written it down. “We are so happy with the work here. We wish we all are learning from our mistakes and growing from strength to strength. I am so delighted to be writing my life story for the world to see when I was small, I was happy. We all were happy. We were close knit family. But the truth dawned, I was labeled autistic. I was so devastated because my mom and dad fought. We were fighting all time, mentally and emotionally drained. We all were not communicating at all. We all stopped talking. In all, we all fell silent. We all ate in silence; we all studied each other silence. We all lived in a world of noise in our heart but silent outside. We all became each other’s enemies. We had to have a break. The break came when I met Jyothi madam. We knew we could chat. We knew we would live like any other human being. We knew we would belong to the world of human beings. We knew we would go far in life. Thanks to Jayashree ma’am, we found our voice in Avaz, We knew it will be our own inner Avaz – Our voice, our strength, our joy, our pride, our journey will continue with SPASTN’s support and love in the value of human lives. We are only your sons and daughters. We are your world, your children. Make it a better place for us all.